A new year is once again upon us. Chances are, if you work in the field of higher education and student affairs, you are uncommonly busy right now. It’s so easy to get caught up in all of this busyness that we can neglect our own development as professionals. In 7 Habits of Highly Effective People, Stephen Covey reminds us that an important part of being useful to others is renewing ourselves as a resource. He referred to this as “sharpening the sword.” To that end, TACUSPA has a number of resources that can help keep you sharp – many of them are easy to integrate into your busy schedule. The first resource I’ll mention is our upcoming fall conference which will take place at the AT&T Center on the campus of The University of Texas at Austin. The conference committee has an amazing learning experience for you. We’ll hear keynote speeches from Dr. Richard Keeling, editor of Learning Reconsidered, Learning Reconsidered 2 and Assessment Reconsidered. His most recent work is titled We’re Losing Our Minds: Rethinking American Higher Education. As his bio explains, “this book argues for substantial change in the culture of higher education to support higher quality and better value in undergraduate education in the United States.” I know you will enjoy hearing from one of the most celebrated thinkers in higher education today. We will also hear from Dr. Marybeth Drechsler Sharp, who serves as Executive Director of the Council for the Advancement of Standards in Higher Education. Finally, I think that a conference highlight will be a fireside chat with Dr. Marcia Baxter Magolda, the scholar behind the theory of self-authorships and the learning partnerships model. She will be interviewed by our own Dr. Gage Paine. TACUSPA offers much more than just a fall conference. Members have the opportunity to enjoy a slate of free webinars that can easily bring professional development to your desk every month. There are opportunities to engage with our Communities of Practice, allowing us to teach and learn from each other. I am constantly reminded that TACUSPA’s greatest resource is our members. I hope to have the opportunity to see you in Austin as we briefly leave our business behind and renew our energy for serving our students! I wish you a happy and successful fall! 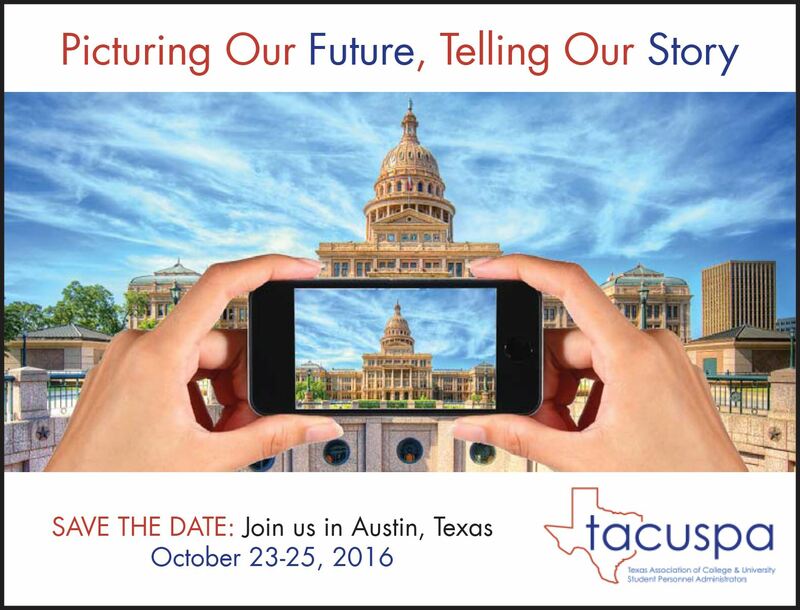 The 2016 TACUSPA Conference will be held in October 23-25, 2016 in Austin, Texas at the AT&T Conference Center. The conference theme is Picturing our Future, Telling our Story. Featured speakers will include Dr. Richard P. Keeling, Principle and Senior Executive Consultant at Keeling and Associates, LLC; Dr. Marcia Baxter Magolda, Distinguished Professor of Educational Leadership and Student Affairs at Miami University of Ohio; and Marybeth Drechsler Sharp, Executive Director for the Advancement of Standards in Higher Education. Register at http://www.tacuspa.net/Conference. All current TACUPSA memberships run through December 31st, 2016. Renewals and new memberships for 2017 will begin around November 1. Watch your email for more information! What were you doing in higher education when you received the fellowship? I was selected as a TACUSPA fellow in 2011. At the time I was working at the UT Health Science Center in San Antonio (UTHSCA) as a Program Coordinator in the Office of Student Life. I had been working in Student Affairs for a little over two years and was finally starting to get the hang of the competencies needed for the profession. My academic background at that time was in communication and marketing so it took some time to understand the ins and outs of student development theory and best practices. At UTHSCSA, I worked with student activities, the peer advisor program, the student government association, and student organizations across the five different schools within the campus. Dr. Lisa McDougle was my supervisor at the time and encouraged me to join TACUSPA. I couldn’t be more grateful that she introduced me to this organization. What are you doing now in higher education? Fast forward five years from my fellowship, I’ve now served almost eight years in the profession. I currently work at the University of the Incarnate Word in San Antonio, as the Assistant Director of University Events & Student Programs. My primary responsibility is to oversee Greek Life and its 13 chapters. Some of my other responsibilities include leadership programs, freshman camp, student programs, and serving on a variety of special project committees. 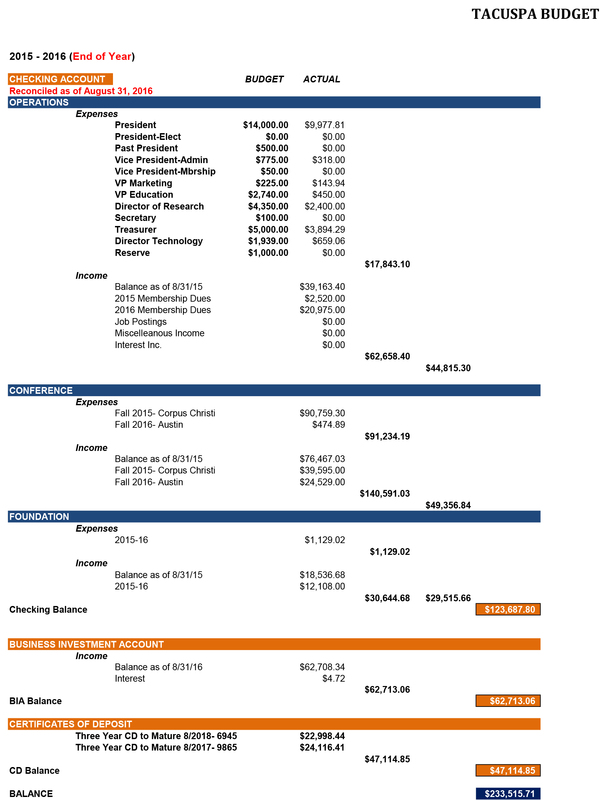 How did the fellowship benefit you? I had the privilege to be paired with Dr. Eliott Chenaux as my mentor. Dr. Chenaux offered very useful advice on many questions I had about a profession in student affairs. Our sessions covered whether there was a need to obtain a doctorate degree to move ahead, what areas of student affairs offered the most growth opportunity, and how to maintain a healthy work/life balance in a profession that tends to follow a 40+ work week. My mentor also put me in touch with other professionals that could offer further insight in areas I was most interested in. The TACUSPA Foundation is excited to announce the new Century Club campaign! This campaign is designed to start the party early by prompting each TACUSPA member to set a goal of giving a total of at least $1000 between now and our 100th Anniversary Celebration in 2025. TACUSPA has contributed to the profession and professionals engaged in Student Affairs work since 1925. The TACUSPA Foundation celebrated this accomplishment last October with a successful $90 for 90 campaign that raised over $10,000 for member fellowships and scholarships. There are a variety of flexible payment plans to fit your needs. 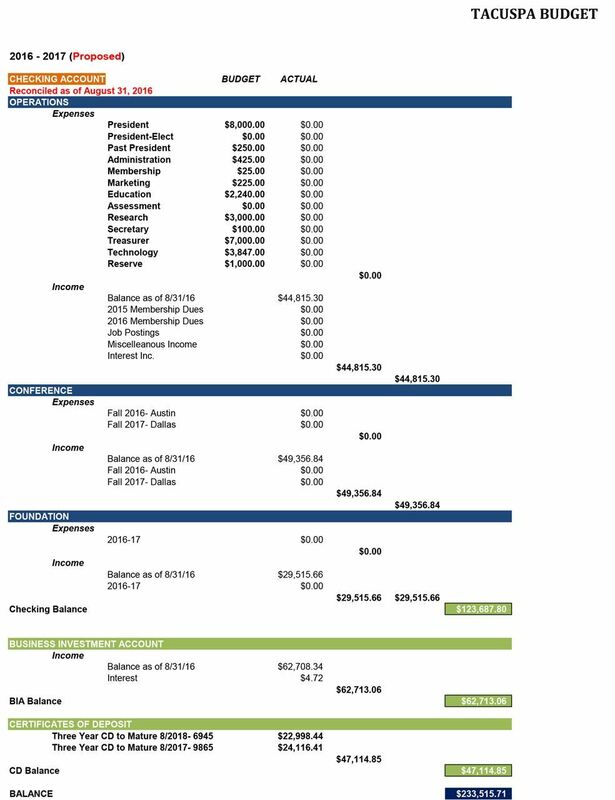 You may decide to give $100 a year for 10 years or start with a smaller amount and increase it over time. Pick the plan that works best for you. Do you want to see your Chief Student Services Officer perform “I’m a Little Teapot” at the TACUSPA conference? If the answer is yes, stop by the Silent Auction room and help to fill the TACUSPA Teapot Jar! If contributions to the TACUSPA Teapot Jar exceed the contributions to the Texas Council of Chief Student Services Officers, the Chief Student Services Officers will perform “I’m a Little Teapot” at the Monday night New President’s Reception. All contributions benefit the TACUSPA Foundation. Please join us for our annual pre-conference golf tournament. This year’s tournament will be held at Roy Kizer Golf Course in Austin, Texas (approximately 25 minutes from the host hotel). The format is 2-person, 18-hole scramble. The deadline for entry is Monday, October 3th. The money raised from this event will be used to assist the TACUSPA Foundation. This golf tournament is generously sponsored by Marmon Mok Architecture. Operates as a subject matter expert regarding employee relations issues such as Title IX, Title VII, and other Baylor College of Medicine policy violations for all levels of personnel within the organization. Manages and resolves highly confidential and complex employee relations issues. The position requires managing multiple cases and high level duties simultaneously while prioritizing the most urgent needs. The University of Houston-Victoria is seeking a Director for the Counseling Center in Victoria, TX. This position directs the university’s Counseling Center; provides institutional leadership with psychological services, assessment, consultation, crisis intervention, and other programs and services. Must have a Masters in counseling, clinical psychology, or counselor education from an accredited school and (4) years related experience; must be eligible for licensure as a professional counselor in the State of Texas; and doctorate in a related field and eligibility for licensure in the State of Texas as a psychologist preferred. To view more about this posting and apply, visit http://uhv.simplehire.com. Dawnetta Smith, MSW, Ed.D. Candidate, is originally from Wichita, KS and has lived in Tarrant County since 2002. Ms. Smith is the Community Relations Coordinator for Tarrant Area Food Bank. She has a Bachelors and Masters in Social Work from the University of Texas at Arlington and is currently pursuing a Doctorate of Education in Leadership at Dallas Baptist University. Her dissertation is titled Programs and Services to Support Single Mothers in Graduating with a Postsecondary Education: A Delphi Study. 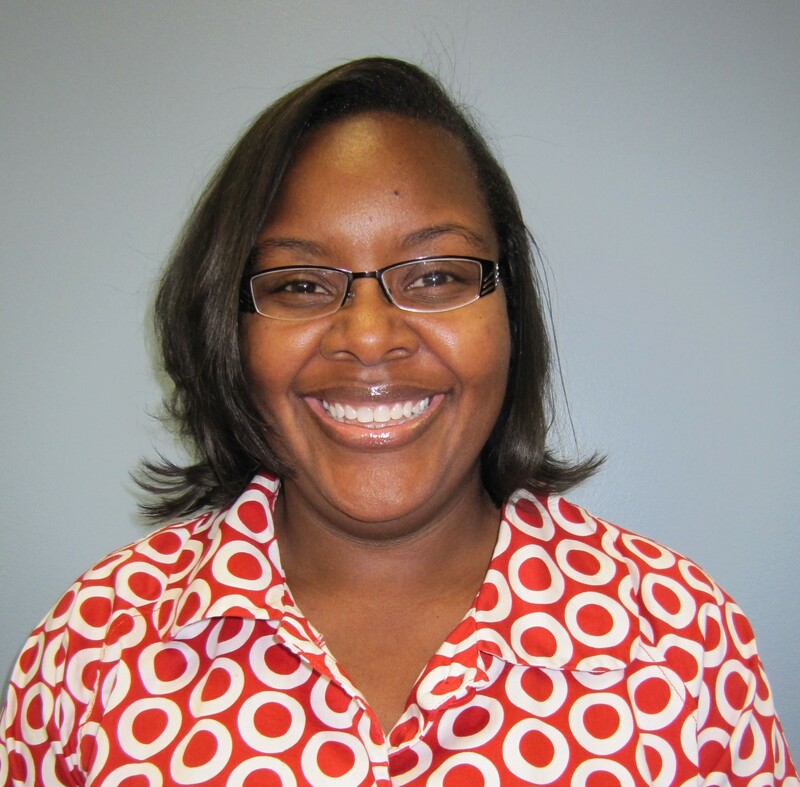 Known for her community service, Ms. Smith has worked with vulnerable families for over 14 years. In 2013, she began an anti-poverty coalition to build greater opportunities for families to thrive and to educate community-based as well as faith-based organizations to better serve families in need. Ms. Smith’s decision to pursue a Doctorate stemmed from her passion to provide families (specifically low-income single mothers) permanent solutions to escape poverty. Ms. Smith will complete her Ed.D. in December 2016 and hopes to work at the community college level in the student development services department with the ultimate goal of becoming a community college President. Newly engaged, Ms. Smith has a 6-year-old son and is planning to marry early next year. Ahmet Aksoy is a Certified Advisor at Northeast Lakeview College, which is one of the Alamo Colleges in San Antonio. 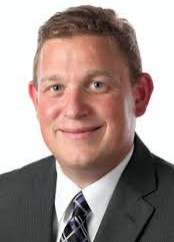 He received his master’s degree in Media and Public Relations from Newcastle University in the United Kingdom and his bachelor’s degree in Communications at East Carolina University. 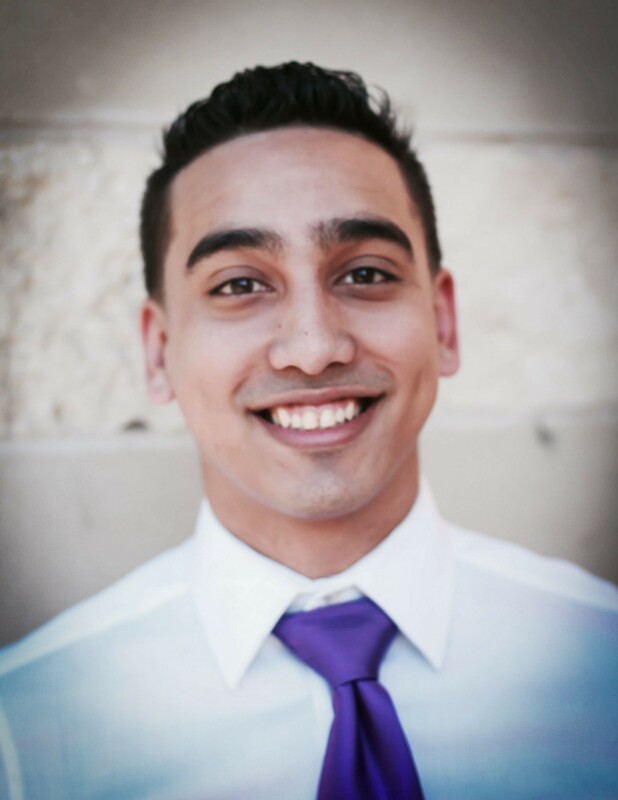 Ahmet’s career in Higher Education began with his employment at Houston Community College’s (HCC) Coleman College for Health Sciences working in their public relations department. His interactions and involvement with the Student Government Association at HCC ignited his love for developing students and paving the road for education for all. 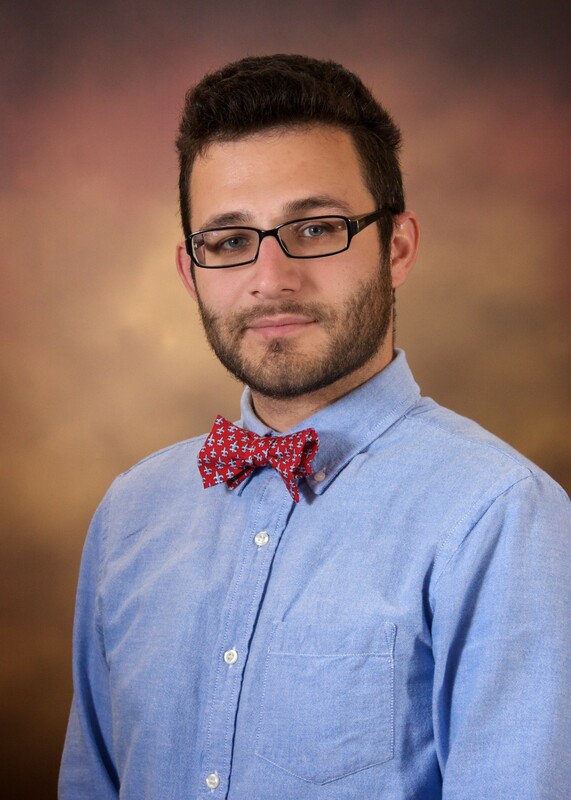 Outside of his work, Ahmet has given his service in the following associations: TACUSPA, ACPA, and the Association of Higher Education Parent/Family Program Professionals (AHEPPP). Kalyn Cavazos is originally from New Braunfels, TX. She is the program coordinator for Parent Relations & Special Programs in the Dean of Students’ Office at Sam Houston State University. She earned both her Bachelor of Arts in Criminal Justice in 2011 and her MA in Higher Education Administration in 2013 from Sam Houston State University. Kalyn is currently pursuing her doctorate in Higher Education Administration at Texas A&M University. 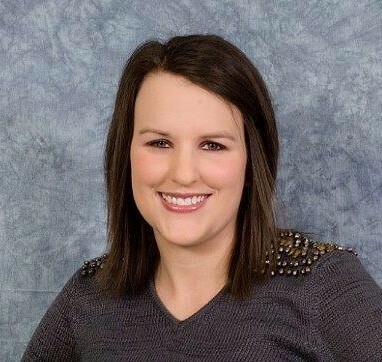 Prior to her current positions, Kalyn served as an Academic Advising Specialist in the College of Criminal Justice and held a graduate assistantship with leadership programs in the Center for Leadership & Service at Sam Houston State. Kalyn volunteers on several university committees and community service organizations in Huntsville, TX. In her spare time, she enjoys going to musical performances, reading, and hanging out with family and friends. 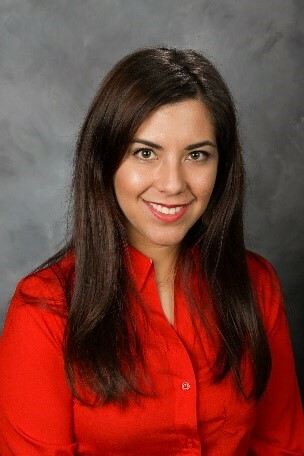 Inmer Cardona is a first generation graduate student from Houston, Texas. He is currently enrolled in the Educational Leadership & Policy Studies program with a concentration in Higher Education Administration at The University of Texas at San Antonio. Inmer received his Bachelor of Science in Applied Learning Development from The University of Texas at Austin in May of 2015. Inmer has experience in leadership development and diversity training and facilitation, and also serves as an advisor for Sigma Lambda Beta International Fraternity, Inc. at St. Mary's University. He plans to pursue a doctoral degree after graduating from his current graduate program. His research interest includes Latino male attrition rates in higher education, access and equity for underrepresented student groups, and social justice education. TACUSPA is pleased to announce that we have entered a partnership with Campus Labs. A higher ed software provider, Campus Labs offers an integrated platform for areas such as assessment and student engagement, and serves more than 1,000 public and private colleges and universities. Campus Labs will provide TACUSPA with vital assessment tools, including the ability to survey our conference attendees and membership, a dedicated assessment consultant, and ongoing assessment support. TACUSPA is recognizing Campus Labs as a Gold Level Conference Sponsor, Webinar Sponsor, and Website Sponsor as part of this mutually beneficial partnership. You will have the opportunity to visit with representatives from Campus Labs in Austin. Please join us in welcoming Campus Labs as a partner of TACUSPA! Join other TACUSPA members in upcoming webinars, which are free for TACUSPA members. Visit the webinar page http://www.tacuspa.net/webinars for more information on the scheduled webinar listed below. Biographies: Angela Calise is a Community Director for the Honors Living Learning Community at Texas A&M University where she advises her hall’s Community Council and co-advises the Encouraging Respect, Acceptance, and Support, through Education program. She possesses her M.S. in Educational Administration with a focus in Student Affairs Administration in Higher Education from Texas A&M University and a B.S. in Psychology from LIU Post. Alyssa Raymond is a Complex Coordinator at The University of Texas at Austin. She graduated from Texas A&M's Student Affairs Administration in Higher Education Masters program and did her undergraduate work in Dubuque, IA at Loras College and received a B.A. in Psychology and Sociology. Iliana B. Melendez currently serves as a Student Conduct Officer with the Dean of Students Office at Texas State University. She has served as a member of the TACUSPA Foundation Board, is a member of this year’s TACUSPA Conference planning committee, and is serving as the TACUSPA Fellowships and Scholarships Chair. Iliana will be continuing to serve as the next Director of Education and Professional Development for TACUSPA. Iliana is a doctoral student in the Adult Professional and Community Education Program at Texas State and serves as an advisor for both LAMBDA of Texas State and Kappa Delta Chi Sorority, Inc.
As the United States continues to be more racially and ethnically diverse, higher education has to respond to the increased presence of diverse student populations that are entering college campuses. One strategy is the numerous Minority-Serving Institutions (MSIs) found throughout the United States and its territories. Authored by Clifton Conrad and Marybeth Gasman, Educating a Diverse Nation: Lessons from Minority-Serving Institutions provides an illuminating look at the experiences offered by MSIs to students, faculty, staff, and surrounding communities. The narratives written by the authors as they visited the four main types of MSIs – Asian American and Native American Pacific Islander-serving institutions (AANAPISIs), Hispanic-serving institutions (HSIs), Historically black colleges and universities (HBCUs), and Tribal colleges and universities (TCUs) – reveals important information on how MSIs produce environments of higher education success and tackle unique challenges faced in achieving this outcome. The book’s seven distinct chapters provide intricate detailed knowledge so readers can start to understand the purpose of MSIs. An introduction chapter introduces three students from different home environments with different pathways to college. Two students come from educationally and economically disadvantaged households. The authors then describe how they use their extensive study on MSIs to create this book with hopes to provide much needed awareness on how MSIs resolve challenges like the ones faced by the students mentioned previously. In Chapter 1, a snapshot of the 2010 census findings provides data that attest to the educational challenges faced by higher education institutions in creating educational success for diverse student populations. Chapter 2 explains why MSIs are culturally relevant institutions. MSIs, we learn, typically have mission statements which pay attention to community constituents within and beyond the campus boundaries. The four major types of MSIs are then presented in a historical lens to provide recognition of their presence in the overall higher education arena. After these introductory chapters, the book provides the author’s accounts of their visits to twelve MSIs. Three distinct institutions under each MSI type are represented in these accounts. MSIs described in the chapters were identified as institutions having practices that led to effective student success. Chapter 3 looks at TCUs with emphasis on how these institutions used collaborative efforts to instill student success in STEM and developmental mathematics. Chapter 4 examines HSIs and the focus placed on community building among students, staff, and faculty for success, especially for first-year students. El Paso Community College’s Early College High Schools is a Texas program that is highlighted in this chapter. Chapter 5 addresses HBCUs and the sense of family contained at these unique institutions and the importance of establishing such an environment to hold one accountable for their success. Dallas’ own Paul Quinn College and its president Dr. Michael Sorrell are highlighted for their “We over Me” motto used for college success. Ch. 6 highlights AANAPISIs and their innovative use student success programs to develop collegial and supportive environments that strengthen community connections and social activism. The book ends with a descriptive list of action items colleges and universities can use empower their underrepresented students attending their institutions based on the lessons learned from the strategies used at the featured MSIs in the book. Upon finishing, readers will feel like they had their own personal tour guides at each of the featured MSIs. Conrad and Gasman’s writing style is extremely engaging and their use of personal narratives highlight the exceptional support systems at MSIs. The book is recommended for those looking to increase their professional knowledge of MSIs and is a valuable resource for research on student success strategies. Readers will leave with a new awareness of MSIs and a keen sense of respect for the role these institutions play in the nationwide discussion on educational opportunity and success. Conrad, C. & Gasman, M. (2015). Educating a Diverse Nation: Lessons from Minority-Serving Institutions. Harvard University Press.